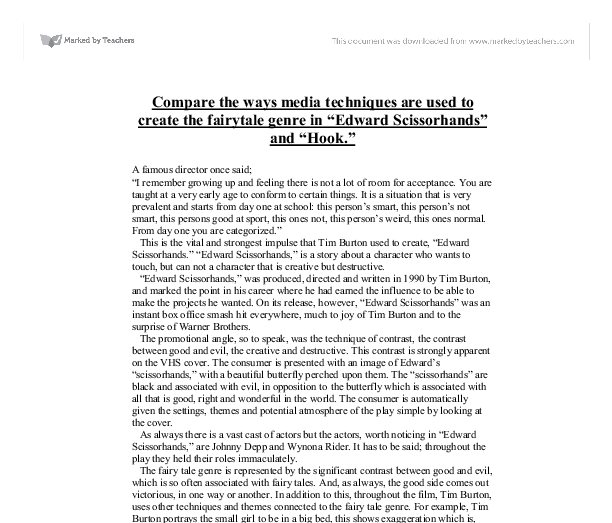 Compare the ways media techniques are used to create the fairytale genre in "Edward Scissorhands" and "Hook." A famous director once said; "I remember growing up and feeling there is not a lot of room for acceptance. You are taught at a very early age to conform to certain things. It is a situation that is very prevalent and starts from day one at school: this person's smart, this person's not smart, this persons good at sport, this ones not, this person's weird, this ones normal. From day one you are categorized." This is the vital and strongest impulse that Tim Burton used to create, "Edward Scissorhands." 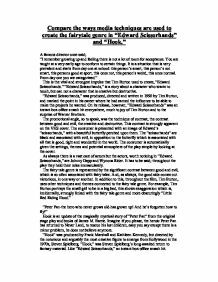 "Edward Scissorhands," is a story about a character who wants to touch, but can not a character that is creative but destructive. "Edward Scissorhands," was produced, directed and written in 1990 by Tim Burton, and marked the point in his career where he had earned the influence to be able to make the projects he wanted. On its release, however, "Edward Scissorhands" was an instant box office smash hit everywhere, much to joy of Tim Burton and to the surprise of Warner Brothers. The promotional angle, so to speak, was the technique of contrast, the contrast between good and evil, the creative and destructive. This contrast is strongly apparent on the VHS cover. The consumer is presented with an image of Edward's "scissorhands," with a beautiful butterfly perched upon them. The "scissorhands" are black and associated with evil, in opposition to the butterfly which is associated with all that is good, right and wonderful in the world. The consumer is automatically given the settings, themes and potential atmosphere of the play simple by looking at the cover. As always there is a vast cast of actors but the actors, worth noticing in "Edward Scissorhands," are Johnny Depp and Wynona Rider. It has to be said; throughout the play they held their roles immaculately. ...read more. Tim Burton displays a lot of shots which suggest that someone or something is watching Peg as she approaches, enters and wonders around in the garden grounds. This mainly consists of shots from a high angle and shot from behind the lost character. It is these very shots that lock that that feeling of worry within the minds of the audience, makes them just want to scream; "Don't do it!" and to stop her from going anywhere near the horrid house. The music begins as Peg rather gingerly enters the ground in the innocently coloured pink dress. The music includes the ghostly howls typical of a church choir. Inside the garden the mood and atmosphere changes very slightly, Tim Burton is still giving out those shots that imply the Peg is being watched but there is a change in music and the bright colours are re-invented. The music is now a strong leap from the music of before, it is now brighter, happier, softer and overall less scary. Tim Burton uses the low and high angle to amazing results. He displays: a low angle shot of the mansion and coincidently portrays its bold and significant importance and a high angle shot of Peg wandering aimlessly around the garden. This particular angle shows Peg's vulnerability in addition to that felling of worry connected to the 'spying.' This whole scene fits in with the fairy tale genre because it is strongly reminiscent "Beauty and the Beast" as the 'beauty' is looking for her father and stumbles across the great castle, except this scenario is more realistic as it is an "Avon lady". This is what Tim Burton was putting across by using all the camera technique; the shots and angles along side the music. The fairy tale genre is then conveyed through the stereotypical door creak as, finally, Peg enters the house. The music now takes a radical change form the comfortable happy and bright tune of the previous, now the audience can hear a deadly cocktail of howls. ...read more. To which unavoidably Jack replies, "Bang, Bang!" Things being what they are the audience sees the family values ripped into pieces. After a series of well chosen close ups Spielberg displays a close up of Granny Wendy and the audience can see that the harsh image of realization has struck her face. Peter Pan has grown up! To conclude, between the two films, "Edward Scissorhands" and "Hook," a vast range of media techniques are used by both directors; Tim Burton and Stephen Spielberg. From: significant contrasts and exaggeration to fantasy and family values. Overall, I believe that Tim Burton used more media techniques that Stephen Spielberg, however in saying that the two films are hard to compare they have completely different themes and storylines. Tim Burton used techniques so often seen in fairytales, for example, a significant contrast between good and evil, strong exaggeration and that stereotypical view associated with the fairy tale genre. Where as Stephen Spielberg did not need to use these techniques as he already had his fairytale in "Peter Pan," all he had to do was keep in with fairy tale genre. He did this in realising and releasing the sheer fantasy adventure linked with "Peter Pan" and adding that twist of irony to bring some humour and to convey that Peter has moved on. Although I have portrayed the two directors to use completely different techniques they did, however, both make great use of sound, colour and camera angles/shots. Burton chose to use quite horrific music and sounds to capture suspense much of the time, a contrast of black on white, to great impact I might add and some very eerie camera angles to show many things from vulnerability, when Peg is entering the castle, to grace, when Winona Ryder is dancing around the flaking ice. Spielberg opted to use more magically inspirational music and sounds to display the children's emotions, an assortment of bright colours to provoke a large amount of imagination from the audience and some obscuringly simple camera shots to help the older viewers relate to, if not become, the younger viewers. ...read more. Elliott uses this to show she wants to go on the trip. She is also bitter toward Felicia and doesn't want him to go to Alice Springs. She constantly insults him. She is very feminine and Elliott uses lots of close-ups to show her femininity to the audience. The music in Edward Scissorhands makes the audience want to cry (tears of joy) whereas in Sleepy Hollow, because you get a sense of death, it makes one wonder who the victims are, who the murderers are and why they are being murdered. I have read this in theory and other people have mentioned how passionate and life-changing theatre can be, but just through illustrating a genre so violent and controversial on stage with real people representing the characters can be so effective to a live audience. Therefore this relates to their techniques of immediacy needed where the use of tracking shots are employed so the audience can see both characters taking advantage of firing missals, rockets and gunshots at each other continuously engineered by their cars. 'Charlie's Angels' uses many different techniques to attract viewers. The lighting is bright and clean to make the trailer appear modern, up to date, and stylish. This relates to the audience, in that young people would like a film to seem modern, stylish and trendy as they also like to be stylish and trendy.